Below is a selection of the highest standard of print products that we personally reviewed and individually selected based on quality craftsmanship, longevity and style. Our supplier is one of the best and delivers reliable colour consistency in our photographic prints. They use professional papers, printers and software to maintain their high quality standards. We are currently offering single prints in three finishes - Fuji Lustre, Fuji Pearl Metallic and Fuji Deep Matte. Starting at $5 for a 4 x 6 on Fuji Lustre paper. This new Carlton frame draws the viewer closer to your images. This display option adds depth to any image with the photo being uniquely recessed ¾ inch within the frame. The 2 inch deep frame moulding is modern with clean lines. finished in white or black cardstock with wire hanger for wall display. These stunning mounts are printed on real photographic paper before they are coated with a high gloss finish. High quality construction, the edges are hand painted with a lacquer finish to compliment the high gloss front. 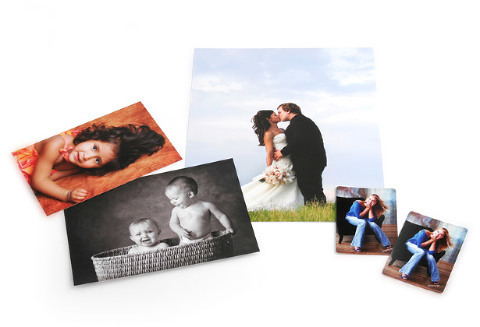 Our HD High Gloss metal prints are a high quality, cast-coated aluminum display. The images offer a clear, luscious and vibrant effect. Through a unique dye process, the colours are infused into a specifically coated metal piece. It is a superior quality for photos and artwork. These displays provide a durable life span for the image and can exert a magical luminescence effect similar to 3-Dimensional. Important: Colour will not exactly match photo prints. Expect a slightly more contrasty look to your image. These showcase quality wall display prints are truly a highlight to any room! Acrylic prints feature better image quality on metallic photographic paper, thicker acrylic for a deeper image effect, smoother refined edges and a more solid black backing. market. Each canvas wrap is reinforced with a front face board for extra strength. The back of the canvas has a finished cover and are ready to hang with wire hanger or metal brackets (if requested) at no extra charge. A set of 4 clear bumpers is included to protect your walls. location to place your hanging nail/screw. This system makes hanging collages simple! Doubling as a stand-alone picture frame, this is a beautiful display on a table with the album sitting inside protected by plexiglass. Our heirloom albums are the perfect way to preserve your images and enjoy them for generations. Choose from a variety of sizes and cover materials to create the perfect keepsake that will last forever.